Like all other natural things, we are built to develop and grow. The illusion in our culture is that we can accumulate the proper accomplishments, style, career, appearance or romances in order to attain happiness. But true happiness ebbs and flows throughout our moments, weeks, and years. It is not a magical threshold we cross into forever, never to look back. If you are suffering, the chances are good that parts of you have stopped or slowed in their natural development. The honest relationship forged in psychotherapy can bring about the insight and clarity needed to begin to grow again. 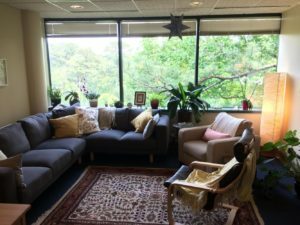 I work with adults and young adults doing individual, couples and group therapy, assessments and lectures both in private practice as well as with local treatment centers. Being a psychotherapist was always my calling but, like many of us, I took a circuitous route to get here. My experience in the nonprofit and for-profit sectors, personnel management and Internet technology has helped me to encounter enough people, places and situations to feel at home in my work. I studied Philosophy and Religious Studies with concentrations in Women’s Studies and Peace and Conflict Studies at Guilford College in North Carolina for my undergraduate degree before moving to Northern California for several years. I received my Masters in Clinical Social Work from Loyola University of Chicago and then moved to Atlanta in 2005. I enjoy practicing with a wide range of client backgrounds and emotional issues. I have specialty training in addiction and recovery, Dialectical Behavioral Therapy (DBT), long-term therapy, survivors of abuse and neglect, the treatment of professionals and trauma.